Mexican cream is rich, thick, tangy and slightly salty. It used to be hard to find in the US, but now you can find it in Latin or International stores, but also mainstream stores! In Mexico, you can find it in any grocery store, and there are richer versions in small towns and ranches, where the cream earns its name “Crema Fresca” and I bet you would feel like me: that you can finish a whole pint in spoonfuls. If you can’t find it, you can substitute it for other kinds of Latin cream, such as the Salvadoran, they are very similar. You can also opt for French Crème Fraîche if you can’t find Latin style creams. Crème Fraîche and Mexican cream are similar, though the former is thicker and less tangy and salty than the latter. Depending on the dish, if it is used for a topping, you can substitute it for sour cream. Yet if it is used for cooking, I prefer to substitute it for regular heavy cream. 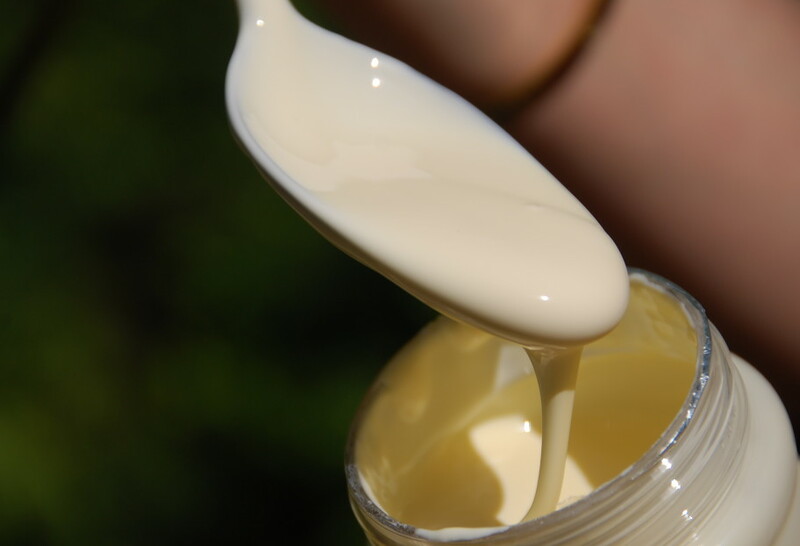 In the photo above, you can see the consistency of Mexican cream, as well as its shine. It really adds another layer or flavor to so many dishes. I recently went to a market that makes fresh Mexican crema and of course I had to buy some. But when I asked for a pound the clerk asked if I wanted with salt or without. I had no clue which to take as I’ve always bought it at my local market in a prepackaged container. Is there a difference in texture or is it as simple as one has salt the other no salt. When your recipes call for crema, which is your preference? I recently bought Mexican style sour cream brand called LALA and to me it smells and tastes kind of a musty taste. Is this how it is supposed to be? I thought on Patis program she says it is sweet and creamy. This is creamy but surely not sweet. Now I have to figure out how to use it. I recently posted a recipe for Esquites (Mexican Corn Salad)- using mayonnaise. Most recipe that I have researched use mayonnaise, however is it proper to use crema instead? Thank you. Yes, of course, many people add both! Due to my husbands job we currently live in a place where Mexican products aren’t available at our neighborhood grocery stores and shipping from online places is not possible. My family misses the Mexican cream with and without salt and the cream salvadorena. Is there a way I can get the recipe? Please! Still waiting for that recipe. THANX! Oh I started working on my new cookbook….but it will be a while…. Hubby just picked some up somewhere, for once I’m thankful for the random things he brings home from the store. This stuff is awesome. We mixed about a teaspoon with 1/3 cup non-fat greek yogurt and it is a perfect substitute for sour cream. I am thinking I may add some agave or truvia to that mixture for a whipped cream substitute. And some almond flavor to the cream itself for my coffee! Super good stuff!! I would like the thick cremá recipe please and thank you in advanced and by the way my husband Loves your show. That is great news! For Mexican cream, try to find it at your grocery store. Either that or any other Latin style cream. If you don’t find it, you can use heavy cream or sour cream, depending on the recipe. I substituted heavy cream in the Tequila Shrimp and it was fantabulous. Next time I am at the international market I’ll be getting Mexican cream. I really would like to try your Enchilada Verde recipe. It looks great! Hello Pati, I love your show and website! I am confused about Mexican Crema. I know that it is slightly sour, similar to creme fraiche, and I love it. I actually make it from scratch often, adding a little buttermilk to heavy cream and letting it sit out overnight. Is there a cream in Mexico that is NOT sour, like whipping cream in the US? And if so, what is it called? Want to try your Tequila shrimp but cannot find Mexican Style Cream anywhere. I have found a mexican “table” cream. Would that be the same? Can I substitute heavy cream with some lemon juice? Hola Joan, You can substitute creme fraiche or heavy cream. I was at a local Mexican grocery store and they had something called jocoque which was tangy and lightly salted too. Is it the same thing with a different name? Jocoque is not the same as Mexican cream, it is a bit thinner and more sour. Both are tangy and a little bit salty!